Stephen Colbert's Wax Figure Unveiled in D.C. Finally, an award fit for a political comedy king. Washington D.C. native Stephen Colbert received a presidential honor in Washington on Friday, taking his place among the 44 United States presidents at Madame Tussaud's D.C. wax museum. Colbert himself was at the museum to unveil the figure, which features his signature eyebrow arch. 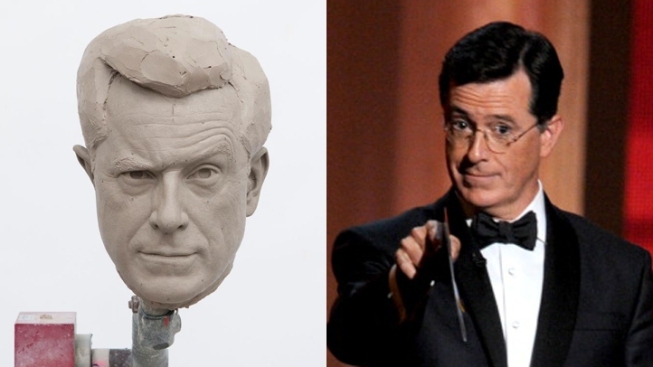 More than 250 measurements and photographs were taken of "The Colbert Report" host at his studio in New York City to ensure a precise re-creation of his likeness. Colbert even donated his own clothes, a full suit, shirt and tie combination, complete with socks, shoes, cuff links and a lapel pin to dress the figure. His iconic eyeglasses were re-created to the exact specification and magnification by wax artists. In addition to the wax figure, a full replica of the "Colbert Report" set is in the works, where guests will be able to take photos sitting next to Colbert at his famous desk.